for an event where they will pit El Güero Canelo against a challenger to find out who has the top Sonoran Dog in Tucson. Fans will be interviewed, and the #1 fan will be featured in the show, which will be part of a companion series to Man V. Food. If you think you're the ultimate El Guëro Canelo fan and want to come to the shoot, or have any questions, please email foodfancasting@gmail.com. Are you going? Are we carpooling? If you've not seen the "Man vs Food" episode about Tucson eateries, I suggest you get around to checking it out. 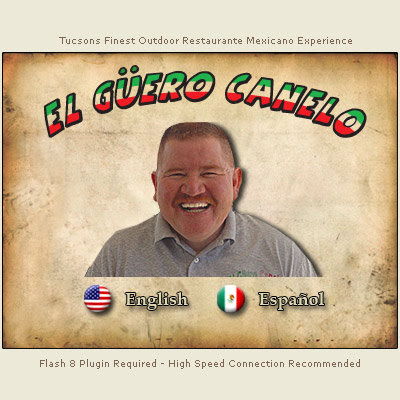 Adam "As-Brooklyn-New York-as-a-guy-can-be" Richman, actually uses the familiar southwest mexican/american buddy slang "buey" to refer to Guero himself. Those "Sonoran Dogs" of his are such a departure from the Sonoran Mexican food that characterizes Tucson Mexican fare unless you happen to be from Hermosillo. I had seen the Tucson Man v. Food episode and after your comment, I posted the links to it! Unfortunately, I won't be attending this event since we have dates at Jonathan's Cork on Friday and Michaelangelo's on Saturday. But I welcome any guest bloggers who might like to post a few words/pix from the Sonoran Dog love-fest!